Book your tickets on the HMS Belfast London and discover the secrets of a WWII relic that took part in some of the most important moments in modern British history. Originally home to almost a thousand servicemen, HMS Belfast London tells fascinating tales of those who resided on board the warship from the Second World War right through to the height of the Cold War. HMS Belfast tickets provide visitors with a snapshot of what life was really like during those turbulent times. It aims to re-create the conditions of the ship, with a special focus on her actions during the D-Day landings. 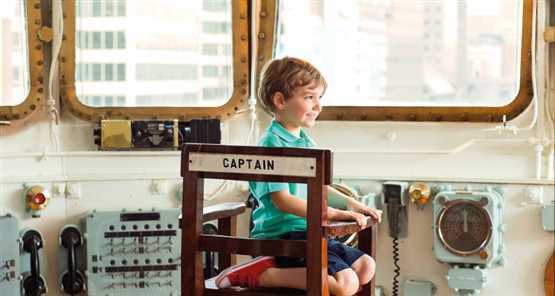 Spread over nine decks packed with military history you'll find a wealth of exhibits showcasing everything from the realities of daily life in the galley to the grand controls of the interactive Operations Room. Listen to veterans’ hair-raising experiences in the Life at Sea Exhibition, and explore what it would have been like to be in the midst of a battle while testing your skills on a Gun Turret. Excellent day out with ex navy husband, son and grandson! Lots to see and good information for ship enthusiasts! We had a fantastic time exploring this vast ship. In hindsight we should have given ourselves more time to explore - we rushed it as we had something else booked BUT what we did see we really enjoyed and was very informative. My 7 year old (and my 21 year old) loved going up and down the ladders into all the various decks, engine room, boiler rooms etc. Great day - but give yourself a good couple of hours. Really interesting and the free audio set was helpful. Such a lot to see. Our 9 year old grandson loved it. After going to London the previous weekend with all the family, myself and my son had to return the following Saturday. Looking for something to do while we were down there I dropped on the Discount London website and was pleasantly surprised on the price savings available. The website made it was very easy to use, so booked to go on HMS Belfast. We had a great time and 2 hours just flew by because there is so much to see. I would highly recommend a visit to the Belfast and using Discount London. Took our godson for a day out at HMS Belfast - prior to going I bought the tickets through Discount London, which were 20% cheaper than buying on the door. Printout in hand, turned up on the day, simply signed the printout, they printed the tix and we were in. Great day out - but wear shoes suitable for going up and down ladders! There's a free audio guide available, some AV displays dotted about, and mannequins in some of the rooms to give atmosphere. I remember coming to HMS Belfast in the 70's as a little boy - was great then and even better now! I enjoyed the London trip very much. I want to go to the other London attractions also. Thank you very much. Thoroughly enjoy the experience aboard the HMS Belfast. I would recommend staff dressed in naval uniforms placed throughout the ship giving talks etc. I brought this for my partner who is interested in history (war related). I came away very impressed - took a good 2+ hours to see everything and you go right down into the ship (on very steep ladder like stairs so not good for people with reduced mobility). The audio tour is free and very informative. Well worth a visit and buying tickets through Discount london made it even better.